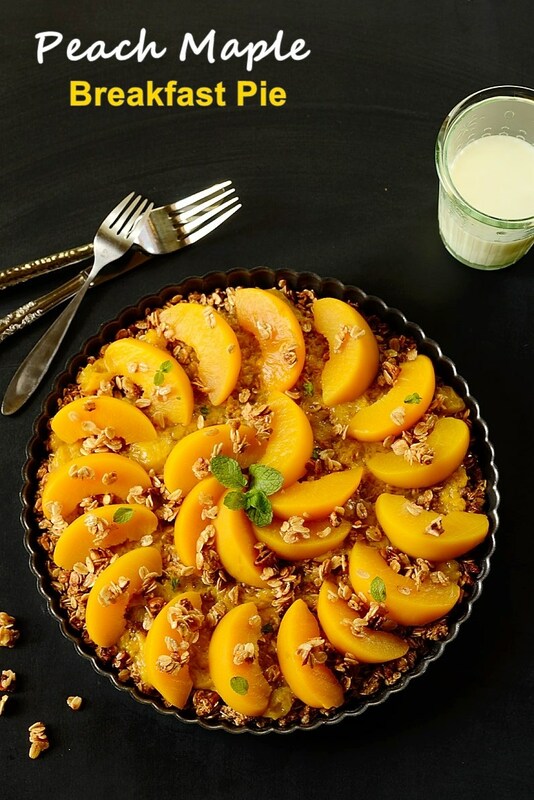 A simple, healthy, and delicious Peach Maple Breakfast Pie that combines a crust made of granola, maple syrup, spices, and pecans, topped with a microwave-prepared peach sauce. What a happy day! Got my kiddos helping me prepare breakfast…. we had pie for breakfast, folks! 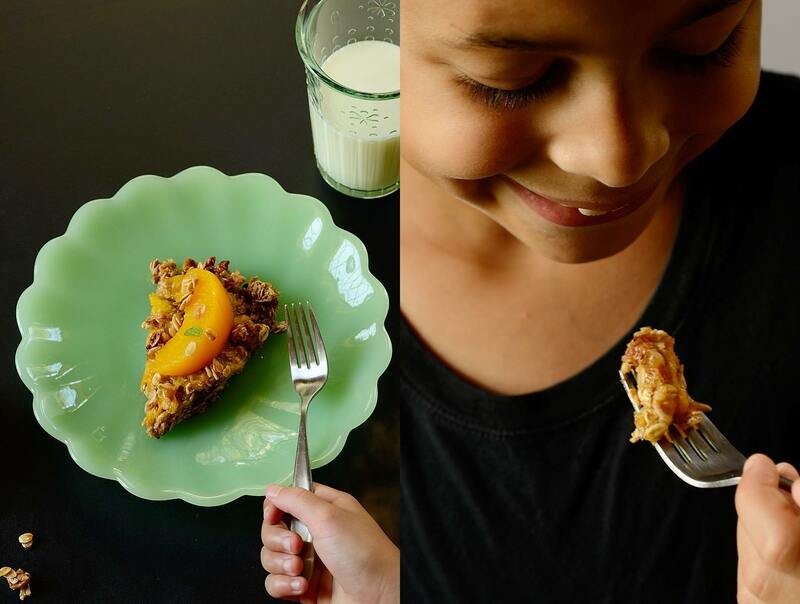 And we had lots of fun together making this simple yet super-delish Peach Maple Breakfast Pie. It was good enough to lick the plate for and come back for seconds! Our breakfast pie was quickly made by combining granola, maple syrup, cinnamon, nutmeg, and chopped pecans (optional) to form into a crust; then pressing the mixture into a pie/tart pan, and baking for about 10 minutes. Once cooled, the pie was topped with a sauce made from combining Dole Sliced Peaches, water, and cornstarch in the microwave for a few seconds… and garnished with sliced peaches. After refrigerating for about 30 minutes, it was ready to be devoured by my hungry kiddos, my hubby, and me. It is a homey, out-of-the-cereal-routine recipe… yet still rich with fiber and other healthy components. As a big fan of peaches, I enjoy the fact that I can have them all year round. Dole Sliced Peaches can easily be found jarred at your local supermarket, packing high-quality fruit in 100% real fruit juice, not the sugary syrup that other competitors use. In addition to helping moms like us prepare tasty recipes like this breakfast pie at home, Dole Sliced Peaches can be conveniently transported as a healthy snack wherever we go. I also like the fact that Dole, a friendly company that’s been around for over 160 years, appreciates the importance of family heritage and cares about their customers sharing family traditions and values — and spending time together preparing healthy and yummy meals is a must at my household. All that I can say is, invite Dole to your home and prepare to be surprised with everything they offer. I hope you also have fun with your family in the kitchen, and that you enjoy our Peach Maple Breakfast Pie. Much love from our kitchen! Grease a 11-inch pie/tart pan with no stick cooking spray. Set aside. In a large mixing bowl, combine 4 cups of granola, flour, spices, maple syrup, and pecans (if desired), stirring until completely combined. 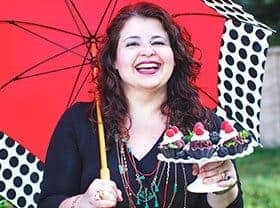 Use a greased wooden spoon or spatula to combine ingredients of the crust, or you can spray your hands with no stick cooking spray so that the mixture doesn't stick. Press mixture into greased pie/tart pan. Bake for about 8-10 minutes, or until golden brown. Let pan cool completely on a rack. Meanwhile, prepare the peach sauce. Stir water and cornstarch in a microwave-safe bowl until well blended. Use a fork to mash about 10 sliced peaches, mix in in the water/cornstarch mixture, and microwave for 2-3 minutes, or until sauce is thickened. 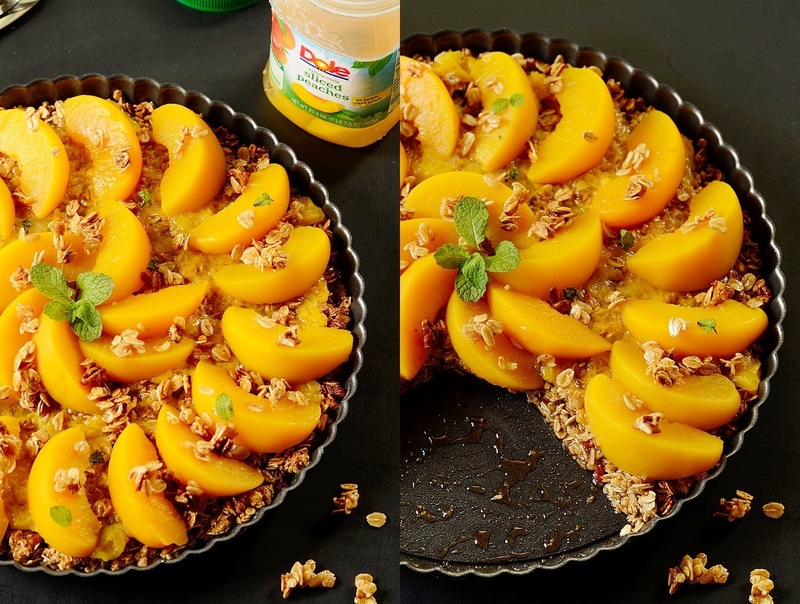 Spread sauce on top of cooled pie and then arrange decoratively about 22-26 Dole Sliced Peaches on top, cover, and refrigerate for 30 minutes, or until chilled. 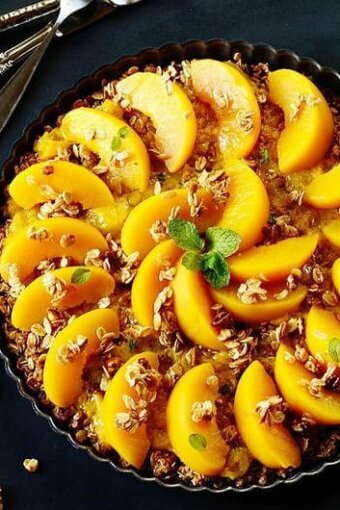 Garnish peach maple breakfast pie with 1/2 cup of granola and serve. It can be topped with a dollop of Greek yogurt if desired. Enjoy! INACTIVE TIME: 30 minutes. STORAGE: Leftovers can be covered and refrigerated for up to 2-3 days. Yeah! To easy to make and a pleasure to eat breakfast! This would be a great way to use my homemade granola, scrumptious! Mmmm, pie! And yes, I sometimes have leftover pie for breakfast. Haven’t baked one specifically for breakfast, though — what a brilliant idea! This looks totally perfect — wonderful recipe. Thanks! And looks very easy to make!!! Oh so gorgeous! I’d have this for breakfast, snack and dessert. Such a clever idea! A pie for breakfast… sounds like a dream! It looks so summery and delicious. And your child is so cute!